As Apple's new iPhone is launched, Dan Simmons tests some of its features and investigates how it and its rivals are changing our mobile habits. 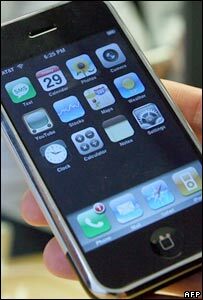 Although smartphones were common before the iPhone debuted in June 2007, few had the impact of Apple's first handset. Since then it has set the industry benchmark, said Darren Neylon, managing director of mobileshop.com. "It's the operating system, in my view, that makes the real difference," he said. Four years of research resulted in a large, responsive touch screen which invited play and made internet use easier. Research suggests iPhone owners are five times more likely to surf the web than the average mobile user. Though the original iPhone was expensive - $599 (£300) at the US launch for the 8GB model - the touch screen and "all-you-can-eat" data tariffs helped drive internet use. It showed the mobile industry how to crack getting the web on the move - something the mobile industry has dreamt about since the introduction of 3G data networks in 2001. But there have been some problems. Customers were locked in to one network in most of the nations in which it was launched and it did not work with the fast 3G networks speeds accessible via other smartphones. Two months after the launch the iPhone was hacked. This meant it could run non-Apple programs and work on any operator's network. These issues aside, it has become an icon and made other manufacturers focus on offering better web browsing on the move. That seems to be paying off as in 2008 mobile web use has taken off. A survey commissioned by Vodafone suggests almost a quarter of 18-25 year olds in the UK now use their mobile to check social networking sites. 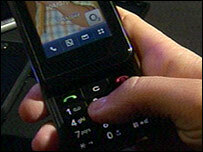 The same study of 700 users suggested around 40% of all UK mobile users now access the internet on their handsets. A separate report, carried out by marketing research company Gfk, suggested that for 1 in 5 users in Japan, their handset has replaced the PC as the way they go online. Other phone manufacturers are tapping into touch. In the past year, touch screens have gone from business-type PDAs to stylus-free style icons. There are even models for avid texters unsure about making the leap. Slider models like LG's KF700 offer a more traditional keypad in addition to the touch screen and there are rumours that Apple may produce something similar too. Nokia, which sells more phones in one week than Apple does in a year, says it will release at least one touch screen smartphone later this year. "I think they're pretty keen to be public about that, to show that they're doing something. Because for a big company like Nokia not to be doing something, I think that's not great for them or the consumer," said Mr Neylon. "There are a lot of loyal Nokia fans out there who want to see an iPhone rival in their hands, that's for sure," he added. Touch has given operating systems a facelift too. Both HTC (Diamond), and Samsung (i900) felt Windows Mobile was powerful but awkward to use. Both companies have developed their own graphical interface to guide users through the most commonly used features of their Windows handsets. Though users can drill down to the original Windows interface to use office apps and fine tune settings, for instance. "It had so many options to choose from, they [users] had lots of trouble trying to find the stuff that they wanted to use," said Rui Antunes, HTC's european marketing director. "We tried to make things easier, and bring out to the top level the key things they were used to using, and make that very interactive, visual and engaging," he added. 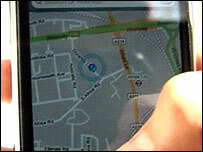 Apple's new 3G iPhone replaces the old one with faster web surfing and also has GPS mapping. Photos taken on the 3G iPhone can be geo-tagged automatically, much like the free Flickr Uploader application found on a Blackberry. The new iPhone lacks a search facility for files or e-mail, it has some Office-style software and easier syncing through Microsoft Exchange, or if you are a personal user, through MobileMe via an annual subscription. However, it may not be what is inside touch smartphones that makes them popular. Price drops could be a factor that helps. Increased data use means operators make more money and can subsidise the handset. Some operators offer a phone for nothing if customers sign a lengthy contract. But making these phones customisable by support for widgets and applications will also drive sales. Apple is just getting started with its App Store but already on offer for other phone are thousands of programs, scattered on different sites across the internet. Alex Reeve, director of Windows Mobile in the UK, said Microsoft had 18,000 applications developed for the Windows Mobile platform. "There's everything from games, music mixers, solutions for sales forces if you're in the business side, sat-nav because a lot of our phones now have GPS built in," he said. Security will need to be tight, and users will probably want better parental controls too - a feature provided on the new iPhone, but lacking in many other handsets - but the floodgates for new ideas on mobiles are now wide open. Nokia is opening up the Symbian operating system, giving third party developers a freer hand. Blackberries now offer much more than just e-mail and Google promises to release a suite of applications on its Android platform on new handsets by the end of this year. 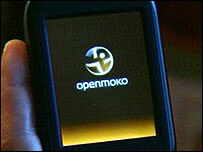 And opening things up reached new heights, when Openmoko released a new open-source handset based on Linux. Every aspect of the phone can be reprogrammed, so a USB port could be used to attach a camera or USB stick rather than just be used for charging. The new iPhone may be stealing the headlines but there is no doubt that the entire mobile industry is changing at a rapid pace.